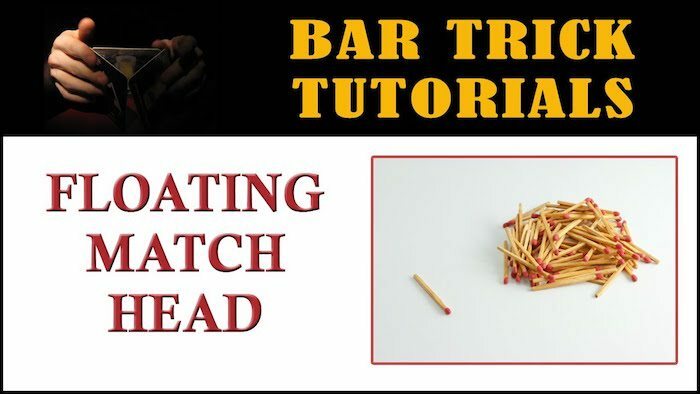 Here’s a bartender magic trick you can pull out at anytime – the floating match head bar trick. This cool match trick is pretty easy to perform – if you have a large thumb! To perform the floating match head pub trick, you’ll need an empty see-through beer bottle filled almost to the top with water as well as some wooden matches. The Bet: Can you get the match head to sink to the bottom of the bottle without turning the bottle upside down (or using any other materials to shove it down)? The trick to this pub trick is that you need a fairly large thumb. Your thumb has to completely cover the top of the bottle so that it’s air tight. If your thumb is too small – like mine in this video – it makes it tough to force the air down and thereby force the match head to the bottom. Practise this bartender magic trick before going out and betting someone. As you can see from the video, it’s not as easy as it may seem at first. Try it with a single match head and then you can graduate to putting in three match heads and having them float at different intervals in the bottle (i.e top, middle, bottom). 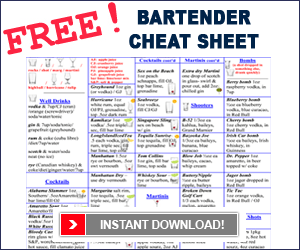 Hey there, Reese Richards from barsandbartending.com, with another bar trick tutorial. In this bar trick, you need a clean beer bottle, just full of water. We just peeled off the label here, so you can, uh, see… and there’s two match heads… so, wooden match heads. Ok, just tear off the match heads and put them inside. So, the bet is: can you make the match heads sink? Ok? So, the match heads are made from wood. Ok? They’re floating. Can you make them sink? Right! So, to do this, you need to completely cover the top, ok, with your thumb, and you need to push the air into the bottle. Ok? There goes one. Come back up. Go, other match! Ok, one. Ok? Did I say two needed to go down? Did I say that? I don’t know, did we mention two? Why did I put two in there? Why didn’t I just go with one? Why did I get over-zealous, you know? Ok, make the one match head sink to the bottom. Right? You know? Just make that one go down. There you go! You know? Why do you need to put two in there, you don’t have to be “big time”, ok big shot? Just make do it! There you go! Ok? Pretty cool nonetheless though, yeah? Good bar trick tutorial. Cheers!